Happy Tuesday Foxy Friends. I hope everyone had a good Monday. I'm still recovering from Mini Fox's birthday party last week. Literally I'm too lazy/tired to clean up the party stuff from last weekend...I really need to get on that...I will, this weekend, maybe. Anyway, I thought I would show you more details of her Little Mermaid party. I tried to be better about taking pictures. 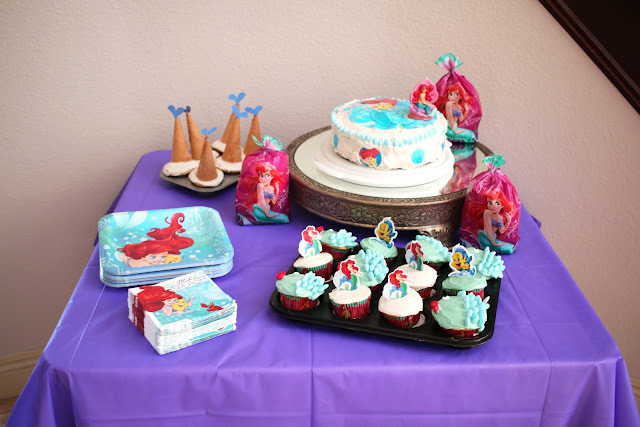 I might have done only slightly better in the past...Mini Fox has been obsessed with all things Ariel for a while now, so when I asked her what she wanted her birthday theme to be it came as no surprise that she wanted an Ariel party. 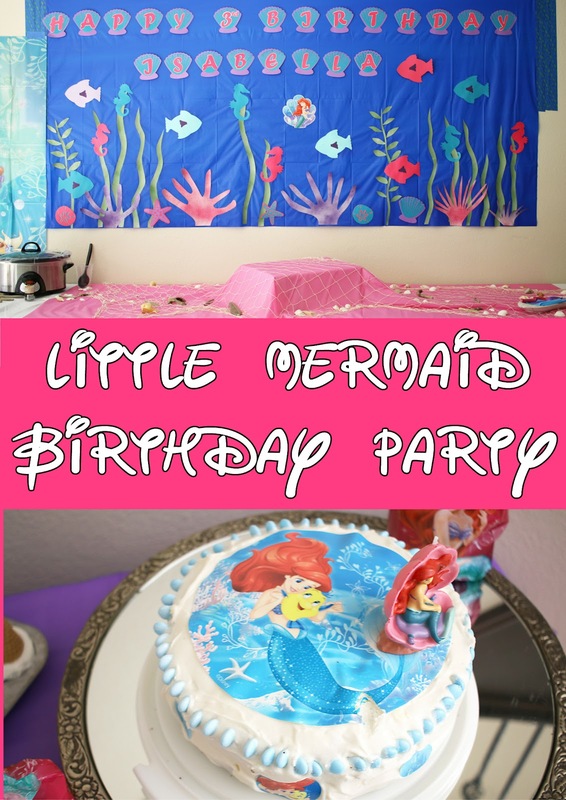 Although if you say Little Mermaid she always corrects you and says, NO it's Ariel. We have a super big open space in our living room, typically I will create a huge background for it. 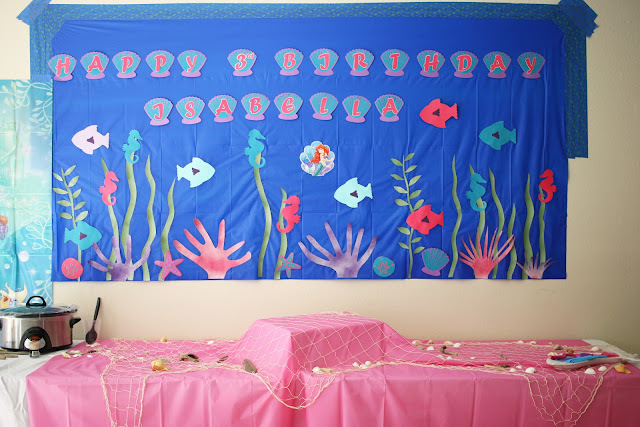 I always start with a plastic table cloth from Party City and go from there, tutorial coming soon. The net I got from Oriental Trading Company. It's pretty thin, so I didn't have to worry about the plates being uneven on them. The shells I borrowed from a neighbor, I think it really makes the whole table, something that you can get at Michael's or Hobby Lobby I would think. My mom said that she wanted to make the cakes and cupcakes, one less thing on my plate, I'm all for it. 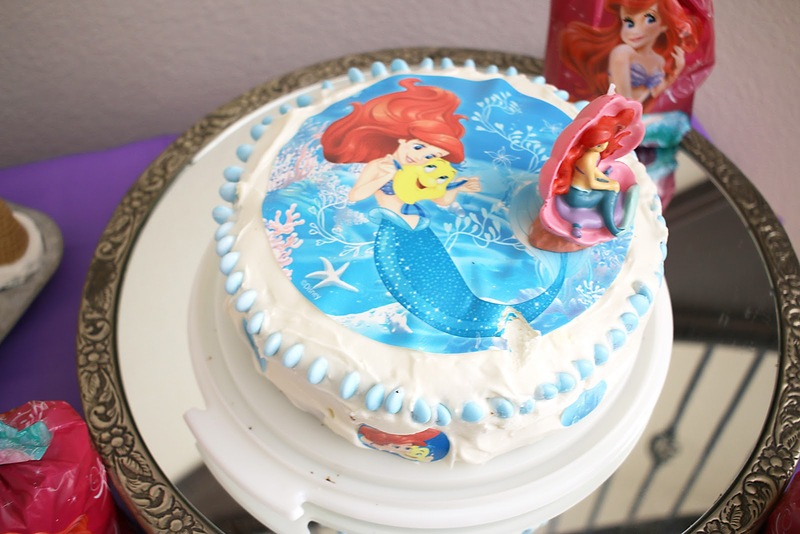 I ended up buying the Ariel cake pictures, turns out it's pretty hard to find a mermaid cake, or anything that my novice skills could recreate, so I went the easy route. My mom definitely thanked me for that one. 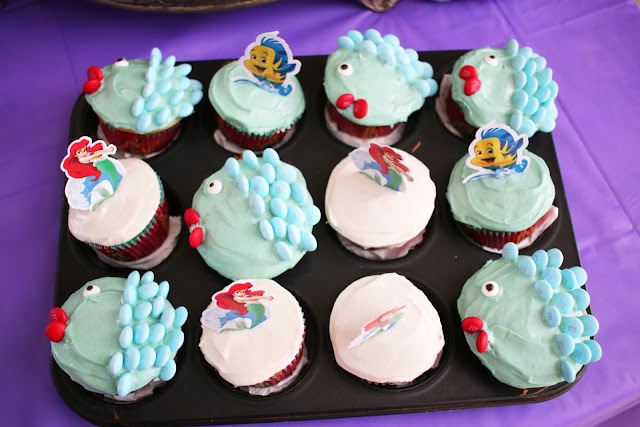 They also found these cute fishy cupcakes and ice cream cone mermaid tails, aren't they just the cutest? For the drink I knew I wanted to do those circles in the background. I basically cut out the circles on my cricut and then sewed them together. Literally the easiest thing on the planet to do. If you want a quick video tutorial on that, comment below and I can put that together! 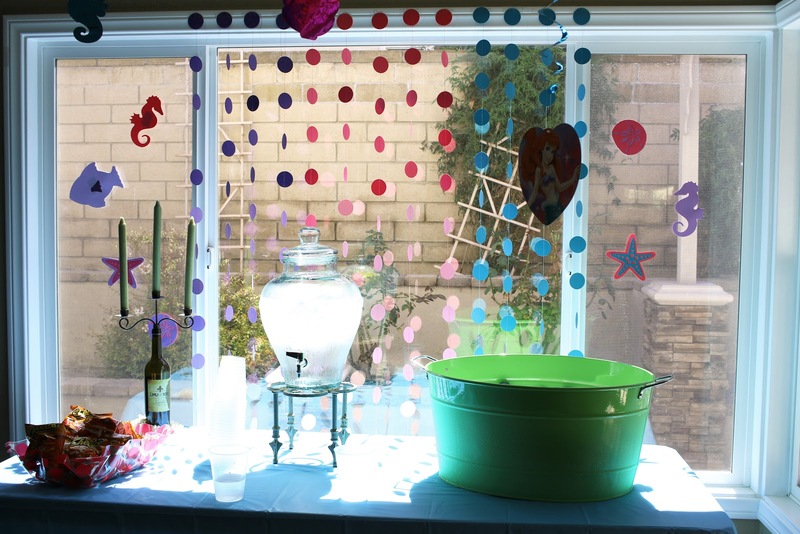 I also made those same circles to decorate Mini Fox's door when she came out of her room. She loved it, and they are currently still there on her door. 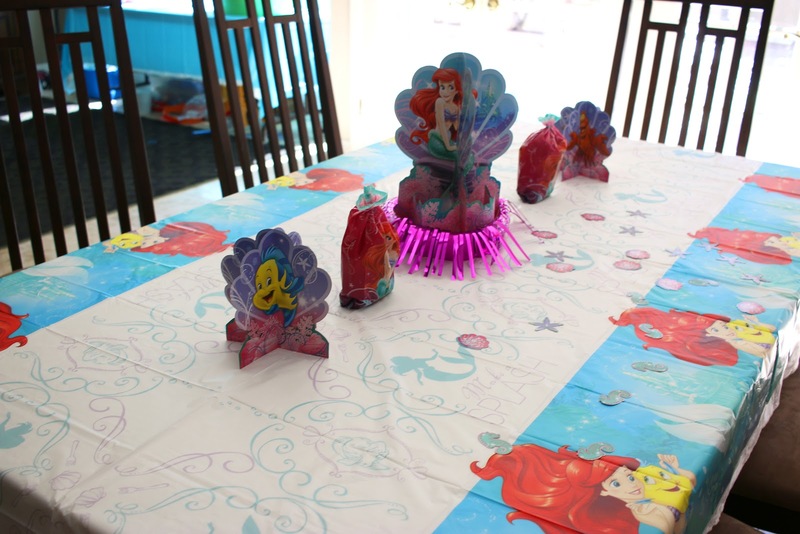 The table I just did the easy stuff, Mermaid tablecloth and the normal table decorations you can find with any themed party you want to throw. 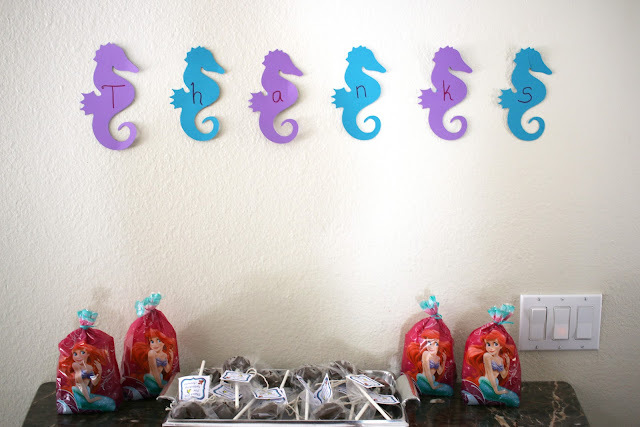 For the thank you's I had some left over sea horses that I didn't use for the background, so I stuck them on the all and I happen to have enough to spell out Thanks, perfect right? I couldn't think of what I wanted to do for thank you's and I felt that the normal goody bag filled with stuff that mom's don't really want to deal with, so instead I decided to make some cake pops. 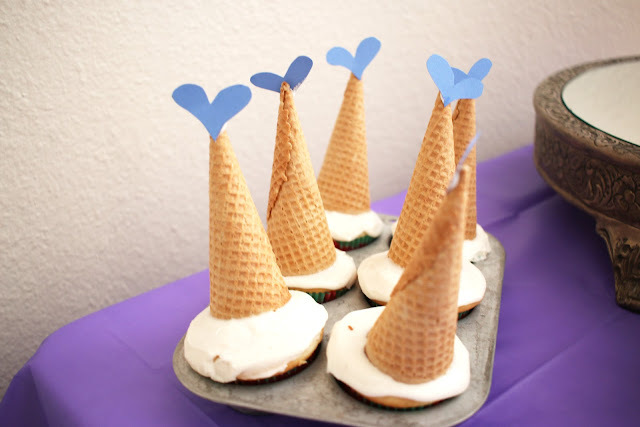 Hey I wasn't making the cake so I might as well make something else right. 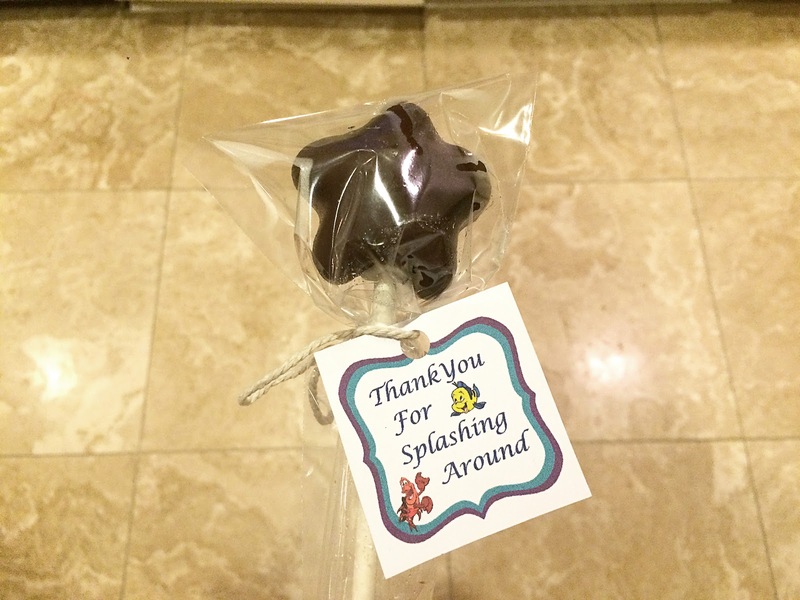 I bought these tongs that had shapes on the end of it, that you put the cake pop mix into, that's how I got the star shape, They also had a shell and a heart shape, but the star looked the best. The last thing I did, super last minute was put together a wreath. I could have used my normal wreath, but decided to make a new one so I could sell it when I was done, or put it on Mini Fox's bedroom door if she wanted it there. I bought the burlap and Mini Fox decided that she wanted pink and the teal color to go with it. I had bought the cupcake toppers thinking I was going to make cupcakes, but my mom ended up making them and she didn't need them, so I last minute stuck them into the wreath. I think it turned out pretty fantastic. 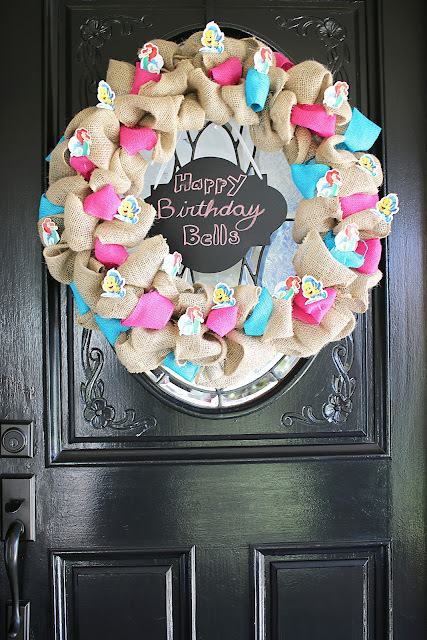 Click here for my basic wreath tutorial, and click here for the color burlap and extra decorations. I make every single one of them the same, so apply those same concepts to this wreath as well. All in all I think the birthday girl had a fantastic time and she said that it was the best birthday ever. Worth all of the hard work I put into it.